In this third installment of the help defense series, I will focus on handler help. For our purposes, handler help will mean playing help defense while covering someone who is even with or behind the disc and in a fairly defined handler position. I will briefly discuss help in flow at the end of the post, but that is really a different idea altogether. Before I start though, I need to clarify a couple of vocabulary points. Handler is a pretty vague term in ultimate because it can refer to a lot of different things depending on the circumstance. For precision, I’ll use handler to refer to anyone in the area around the disc including the thrower and reset to refer to those players other than the thrower. Depending on the set, there could be as few as one reset (no dump) or as many as three (German). The biggest problem you are confronted with while playing handler help is that you are already on stage, so leaving your assignment to help immediately makes him or her open. If you are defending down the field, you rarely want to leave your assignment wide open unless you are getting a block or stopping a goal, but around the disc there are some factors working to make leaving someone wide open a good idea. First, you aren’t giving up yards. Because of the positioning of the handler, even if they do get it, they aren’t gaining anything. Second and perhaps more importantly is the rhythm of the offense. All offenses have a rhythm to them, they breathe like a person, an expanding and contracting that is connected to both the flow of play and the stall count. Most offenses don’t want to throw swings or dumps until higher in the stall count, instead preferring to use the early seconds to look downfield for big yardage gainers. This creates a kind of temporal dead space; although the thrower could go straight to your assignment, they won’t and so you are free to help. Specifically, many of the offenses that young and inexperienced teams play require the thrower to look at the dump at a certain moment in the stall count, usually 5 or 6. Look for this, and when you recognize it, take advantage of it to help while simultaneously preparing to recover and play tight defense. This brings us to a second key concept for handler help, flash and recover. Handler defense often puts you within a step or two of the throwing lanes. As you are playing defense on your assignment, keep your head up and when see a developing cut downfield, flash into the lane and then quickly recover back to your defensive positioning. If you are lucky, you will get a block here, but more often you will stop the throw, chop tens of yards off of a comeback cut or give another defender time to close separation. One specific flash and recover technique involves working off of the break side. (Diagram 1) There are many offenses that put the handler reset out on the break side to prevent their defender from helping on the open side. Defenders often oblige the offense because they don’t realize who they should be working in tandem with: the marker. As a defender, you are in the around space and so the marker doesn’t need to cover it as much. A couple quick words (their name and ‘I got around’) is all it takes to let a defender who is aware of this stunt know what they need to do. They slide their mark over to shut down the inside out and pressure the open side while you cover the around. When the circumstances dictate that you move (and they will), a simple ‘I’m out’ lets the marker know to return to standard positioning. Another very common two person technique is the slide over. Both examples of this technique involve the marker and the handler defender switching assignments. This is an easy switch once you see it; it is actually more work to stay with your assignment because you have to overrun the other defender. In the first example, (Diagram 2) the offense is attempting to run a give-and-go. 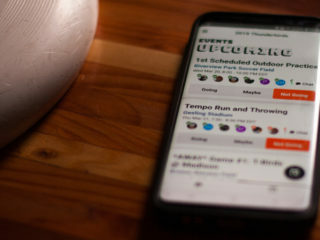 The key moment is when the first throw in the give-and-go is released. The defender (B) on the pass can see the give-and-go in development on the release; either the thrower is already at full speed or they are using the more slowly developing up-seal and over move (Pictured; it involves taking an initial step or two straight forward, sealing your marker away from open side marking and then attacking across the field.) It doesn’t matter which, just that the defender (B) recognizes that the original thrower is coming their way. Instead of moving down and marking, the defender (B) stays about five yards off of the disc and waits – the give-and-go cutter comes right to them and the original marker (A) slides straight over and establishes a second mark in a row. Be aware that there is a brief hole between the two defenders. I’d recommend leaving it barely open because the cost of fully shutting it down is to give too much space around the edges, but that decision is another layer down. The other example of the slide over (Diagram 3) is off of the dishy reset move. The dishy is where the handler, working entirely behind the disc, runs from the open side to the break side, receiving a little lift pass on the way. With the defender (B) trailing, the dump now has access to the entire break lane. Central Florida’s Sunny Harris used this move repeatedly in their semifinals campaign last spring. Although the defensive moves are similar to those used against the give-and-go, the process is in a slightly different order. This time, it is the marker (A) who does the recognition; they can see the dishy cut developing right before their eyes and it is a simple matter to continue their momentum out into the throwing lane to stop the continuation. As with the slide over on the give-and-go, there is a brief gap between the two defenders; it is imperative that the other defender (B) quickly reposition so as not to be exploited. The next technique I want to look at is off of two-reset sets. Typically, you’ll see these sets as a part of a horizontal offense, but sometimes they show up as a sideline modification to a vertical stack. Let’s look first at the case where both resets are on the same side of the disc. In this situation, the far reset defender is in dead space and definitely should be helping. Typically what people do is drop straight back or slightly toward the disc and back, hoping vaguely to protect some of the interior lanes. (Diagram 4) This is the most worthless thing you can do. You are leaving your assignment open, but you aren’t really covering anything else. All you’ve done is moved from dead space on your assignment to dead space separated from your assignment! The best thing to do in this situation is to move straight toward the disc and pressure the reset space. (Diagram 5) Depending on the circumstances, you can be more or less aggressive, but at a minimum you should be driving the reset in to a major loss of yards and then not letting them swing the disc back out again. There are a few rare occasions when it makes sense to drop all the way out into the cutting lanes from here, but be aware that you have to go a long, long way to be effective and that your recovery will be challenging. 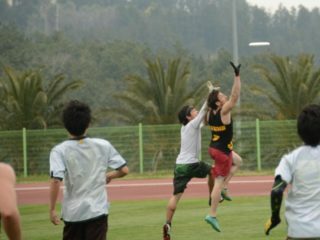 When the disc is splitting the two reset defenders, the classic help is to drop both defenders off into the cutting lanes and force the disc to the sideline. (Diagram 6) This is an excellent defense and I would highly recommend it against any team that is playing a traditional horizontal. The horizontal is very weak on the sideline; holding the offense pinned in this part of the field is what you want to do, so don’t give up the free pass back to the middle. You may have noticed major similarities between these moves and the cup work from a zone defense. This is a great observation and applying it will strengthen both your zone work and your help man techniques. The last piece for this post is the concept of help in flow. Although this isn’t technically handler help, it does involve helping from behind the disc. As play progresses down the field, there are many, many occasions where multiple offensive and defensive players are behind the disc. Typically, these defenders meekly trot along with their assignment, preparing for when it is their turn to play active defense again. Why?! Their assignment isn’t doing anything and is in a horrible dead space position behind the disc! These defenders should put forth some effort, hustle downfield and into a throwing lane. They can clog up flow or slow a fast break, while simultaneously preparing for the moment when they’ll have to recover back to their assignment. There is no current team that takes advantage of stay-on-your guy defending more than Revolver. Their cutters often delay their clears and repositions and lag behind the play for an extra second or two. This creates massive spaces downfield, but it also creates massive opportunities to help in flow. A final note as I wrap up this series up for now. There is an assumption that help defense is soft or lazy; that somehow it isn’t honest or doesn’t express good Protestant work ethic values. A huge part of this comes from watching people who are soft or lazy playing poachy, soft and lazy defense so that the defense itself has taken on the persona of these practitioners. 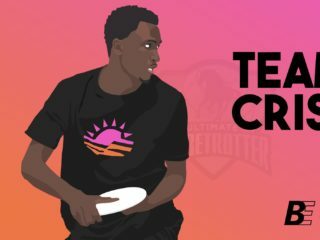 The best defenders in ultimate right now are the ones who can take the tough assignments without help. ‘I can do it,’ they think, ‘so everyone else should be able to as well.’ Help defense doesn’t have to be lazily; done correctly it is actually far more work than vanilla defense is. If you use help in flow techniques, you’ll be adding multiple 30 yard sprints to every point. The same is true of any flash and recover techniques. As for help defense being soft, it’s all in how you play. Truly great defense will wed help concepts to tough, grinding, physical man-to-man.